According to www.etymonline.com, surveillance entered the language in “1802, from French surveillance “oversight, supervision, a watch,” noun of action from surveiller “oversee, watch” (17c. ), from sur- “over” (see sur- (1)) + veiller “to watch,” from Latin vigilare, from vigil “watchful” (from PIE root *weg- “to be strong, be lively”). Seemingly a word that came to English from the Terror in France (“surveillance committees” were formed in every French municipality in March 1793 by order of the Convention to monitor the actions and movements of suspect persons, outsiders, and dissidents).” But surveil doesn’t enter the language until 1903, according to the same source. According to www.dictionary.com, the word is not recorded until 1965! The Oxford English Dictionary concurs with dictionary.com. What we do not have yet in English is a noun derived from surveil to indicate a person who engages in surveillance, or a surveillor. I find this interesting because it seems like such a noun would be the logical next step, but so far it hasn’t happened. I know this because my wife tried to use the not-yet-a-word in a chapter she is writing, and she got the red squiggly line. When we think about the US space program, we usually think of the manned missions, like Apollo or the Space Shuttle program. Less in our consciousness is the unmanned side of NASA. 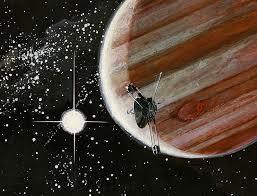 But in 1972, NASA launched Pioneer 10, whose mission was to cross the asteroid belt and transmit back images of Jupiter. A year and a half after it was launched, it took its first pictures of Jupiter from a distance of about 16 million miles. The closest it got to Jupiter was about 82,000 miles, and it sent over 500 images back to Earth. Then, using the gravity of Jupiter, NASA used the slingshot effect to create enough velocity that Pioneer 10 could leave the Solar System. Pioneer 10 passed the orbit Saturn in 1976, that of Uranus in 1979, and that of Neptune in 1983. The mission officially ended on March 31, 1997, when Pioneer 10 was 67 Astronomical Units (AU), or about 6.2 billion miles from the Sun (an AU is the distance from the center of the Earth to the center of the Sun, or the average of the various distances). The last signal from Pioneer 10 was received on this date in 2003, from a distance of about 80 AU from the Sun. In a way, it is sad. We lost the most distant surveillor of the universe that we have ever had.